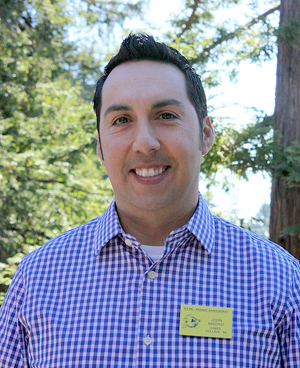 "UC Santa Cruz was and still is a magical place for me," says alumni volunteer John Madrid. UC Santa Cruz was and still is a magical place for me. A huge part of what I learned there, both inside and outside of my declared major, was a sense of social justice and giving back to the community. These ideals have remained with me ever since I left UC Santa Cruz and are a key part of why I volunteer. I have had the privilege to serve on the Alumni Council for seven years, I was the treasurer for the LA chapter of UC Santa Cruz volunteers for two years, I help with hosting local happy hours for Los Angeles alumni, and I have participated in the high school outreach program. The list is numerous. However, I have particularly enjoyed giving back to the campus and faculty that helped to shape my life in so many ways. Additionally, it has been such a pleasure to work with and meet incoming and existing students, as well as alumni of UC Santa Cruz. Some of my closest friends today are fellow alumni that I met while volunteering for campus. What are you waiting for? Volunteering for UC Santa Cruz not only provides you with the opportunity to give back to campus but also a chance to reconnect with current students and fellow alumni. There are hundreds, and I love getting the chance to re-live them whenever I visit campus. A few that stand out, however, are “surfing the web” for the first time in my life at the Oakes computer lab in the mid '90’s; getting accepted to the Education Abroad Program and having the opportunity to study abroad for a year; and exploratory walks on campus at night that included many false sightings of mountain lions, drum circles, and finding new paths to navigate campus.